2015 Entertainment Weekly interview with Home Alone director, Chris Columbus. Includes reference to how frightening it was filming the stunts. Article from The Independent on The Good Son’s trek through development Hell. Erin: In 2015, the web series :DRYVRS released its first episode, which guest-starred Macaulay Culkin reprising his role as Kevin McCallister, now grown up. Lindsay: In this darkly comedic parody, Kevin captures, kidnaps, tortures, and presumably kills a man who carjacked him. Erin: The episode alludes to the events of Home Alone and strongly implies they scarred Kevin for life. The adult Kevin also displays similar skills to those that helped his younger self. He’s brave, quick-thinking, and almost supernaturally effective. Lindsay: The short is both funny and disturbing, and it clearly demonstrates that the actor has a sense of humor about his iconic role. Erin: It also seems to invite viewers to reconsider the character of Kevin McCallister. Was he ever an innocent child? Or was he always something far more disturbing? Lindsay: :DRYVRS isn’t alone in asking this question. Today, Mainlining Christmas is going to peer into the history of one of the holiday’s most controversial modern characters in the hopes of gaining some insight into what he represents. 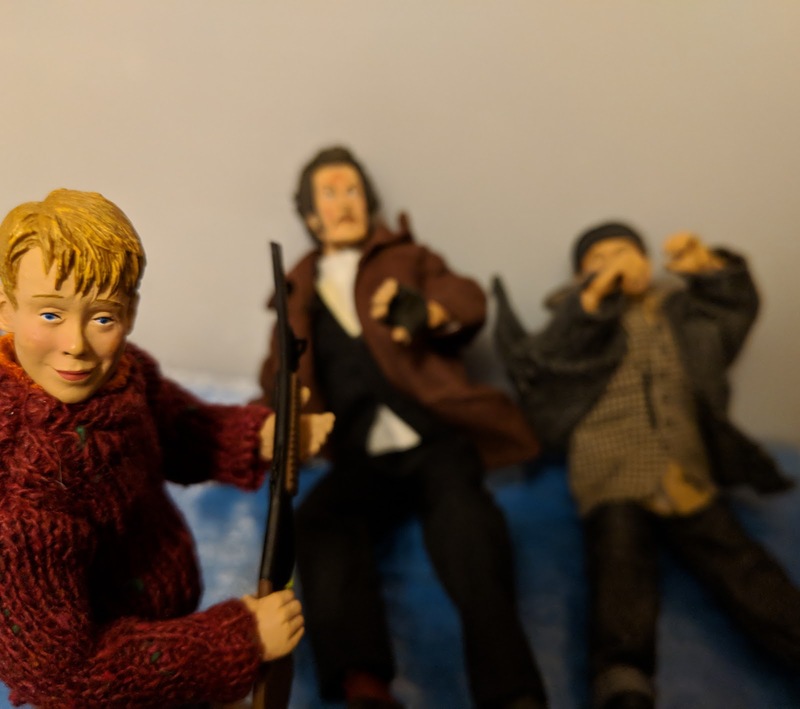 Erin: While there have been a total of five Home Alone movies, and three of them feature some version of Kevin as the lead, today's discussion is only going to focus on the first two installments. Lindsay: In other words, we’re not going to talk about the made-for-TV sequel from 2002, even though the character Kevin is technically in it. In that one, all the characters are played by new actors, and it doesn’t quite work with the established continuity anyway. Also, we’ve never seen any indication that anyone alive has ever seen it, other than us. Erin: Exactly. Like the third and fifth installments, Home Alone 4 is interesting as an artifact, but it’s not really part of the series’ enduring legacy. And, as odd as this might sound, legacy is something we’re going to be focusing on today. Lindsay: This is as much about Kevin as he exists in the public consciousness as it is about the character in the first two films. Erin: That being said, I can’t think of a better place to start than the 1990 movie, so let’s dig in. Erin: Yeah, there are things to respect and even maybe like about Home Alone, but I’ll never understand why it’s as fondly remembered as it is. Overall, I just don’t find it funny. Lindsay: Plenty of people do. There are fans who love this and consider it one of the best Christmas movies out there. Erin: I really wish that the comedy connected with me, but it just doesn’t. The physical humor in this just makes me wince. Lindsay: I think it’s harder to enjoy when you’re an adult. Kids see the slapstick falls, burns, and hits, and think Looney Tunes. But I see that stuff now and I just feel it on a visceral level. Erin: Right. Because these aren’t cartoons. They’re actual people, and the hits that they’re taking look painful. Lindsay: Apparently, it was terrifying to film. They had stuntmen performing those sequences, and the crew was never sure if they were okay. Erin: Yeah, I mean, credit where it’s due, those stuntmen did impressive work. It’s just hard to watch those scenes and think that they’re lighthearted and funny. Lindsay: And yet, we’re supposed to see the architect of that pain and destruction as the protagonist. Erin: Protagonist, hero, and adorable eight-year-old kid. That’s kind of what opened the door for people to start asking whether Kevin might be a sociopath. Lindsay: And once we start asking, the movie gives us plenty of clues that the answer might be yes. Erin: Home Alone opens with Kevin acting cruelly towards his family. Now, he’s hardly the only character who's acting selfishly in this sequence, but it’s notable that he ignores every other character’s feelings, and that he becomes violent and destructive when he doesn’t get his way. Lindsay: His arc in the movie takes him from wanting his family to disappear to wanting them back. But at no point does he seem concerned with them as people. He misses them - even loves them - but there’s no real indication he understands that they have feelings. Erin: Even when he regrets their absence, he still seems to view them as objects. They’re objects he wants in his life instead of objects that he wants gone, but we don’t really see much evidence that he’s capable of empathy. Lindsay: He certainly doesn’t show any towards the pizza delivery boy. Erin: Right. This character, the pizza delivery boy, appears a couple times in the movie, first at the beginning when he drops off ten pizzas, only one of which is cheese. Lindsay: And Kevin blames him for not bringing more cheese pizzas, despite the fact that he’s just the guy who delivered them, not the one who placed the order. Erin: Once Kevin is “home alone,” he orders a pizza all for himself. Rather than meet the delivery boy in person, he stages an elaborate ruse using some audio from an old movie to create the illusion the pizza is being delivered to a mobster who's shooting a machine gun at the kid delivering it. Lindsay: It’s not at all realistic, but for some reason this fools the delivery boy, who flees in terror, thinking his life is in danger. Erin: And Kevin finds this hilarious. Lindsay: There’s no real justification for this kind of punishment. The delivery boy wasn’t cruel to Kevin. He does mutter “cheapskate” when he’s slipped a trivial tip for the pizza, but really, who can blame him? He’s working a few days before Christmas and someone he thinks is a grown adult gives him twenty cents for a tip. I’d be angry, too. Erin: The only indication we see that implies this kid deserves any kind of punishment comes when he hits a small statue that the McCallisters have at the end of their driveway. He knocks this over and replaces it both times he delivers to their house. Lindsay: It should be noted Kevin doesn’t see this happen either time. This is for the audience’s benefit, it’s not related to Kevin’s motivation. Erin: Either way, it’s certainly not egregious enough to justify Kevin’s revenge. Kevin convinces him he’s about to die, and he never shows any remorse for this. Lindsay: Same goes for another character hurt by Kevin’s actions. This one’s less serious, but it still demonstrates a lack of empathy. When Kevin accidentally steals a toothbrush, he’s pursued by a police officer. To escape, Kevin leads him over an icy pond, and the officer falls. Erin: The movie doesn’t imply he was seriously hurt, but he certainly could have been. When Kevin escapes, he’s concerned with the danger he thinks he might be in personally, but he never thinks twice about the wellbeing of the cop. Erin: --It still astonishes me they named that character Marley. Even in this thing, that’s an amazing lack of subtlety. Lindsay: Agreed. But when Kevin sees him reunited with his own family, the boy sheds a tear. It’s not much after a movie full of cruelty, but it does demonstrate the kid is capable of human emotion. Erin: He also shows a little empathy towards the homeless bird lady in Home Alone 2. Sort of. Lindsay: He tells her she should open her heart to others, and he gives her a bird ornament that he got for free. After he spent almost a thousand bucks on room service. Erin: That moral could have used some work, but at least it seemed like they wanted him to care. Lindsay: Oddly, they passed up a chance to demonstrate Kevin caring about the children’s hospital. Quick reminder: in Home Alone 2, the thieves plan to steal a big pile of money raised for said hospital. The writers set this up as the motive for Kevin going after the thieves again, but then they pivoted to a less noble idea when the bird lady tells Kevin explicitly that “good deeds negate bad deeds.” We’re not shown that Kevin cares about the kids in the hospital, only that he cares about his own karma for his misbehavior. Erin: The writer could probably have benefited from a lesson on ethics. Lindsay: Again, Kevin’s actions are ultimately selfish. Erin: Not everything he does, but certainly his main choice. He’s protecting someone else’s property this time, but he’s still doing it to balance the scales with God or something, I think. Lindsay: And, once again, he hurts a lot of people along the way. Erin: Other than Harry and Marv, most of the people he messes with are employees of the hotel that he’s staying at. Lindsay: And there’s a lot to unpack there. The homophobia around Tim Curry’s character alone could be its own topic. Erin: God, those jokes did not age well. Lindsay: And his treatment of Rob Schneider’s character was reminiscent of what he did to the pizza boy. Erin: The bellhop. Another character in the service industry who gets humiliated and ripped off by Kevin. Lindsay: This time, it’s completely clear Kevin knows what he’s doing. We watch the kid toy with the bellhop on tips. Erin: There’s no denying Kevin enjoys being cruel. The second movie spends more effort selling the idea that some of these characters deserve retribution, but the kid still just revels in their suffering. Erin: I want to jump ahead to 1993, which saw the release of a movie that some consider an unofficial third installment in the Home Alone series. Lindsay: The Good Son came out just a year after Home Alone 2, so the antics of Kevin McCallister were still fresh in the minds of moviegoers. Erin: It’s not a good movie, but - thanks to its casting - it is definitely fascinating. Lindsay: The movie stars Elijah Wood as a boy who’s recently lost his mother and has to spend a few weeks with extended family. He’s taken in by his aunt and forms an emotional bond with her. But his cousin, played by Macaulay Culkin, is a sociopath secretly responsible for the death of one sibling. Now, he’s targeting other family members, and it’s up to Elijah Wood to stop him. Erin: It’s difficult to convey just how absurd all of this is. Elijah Wood’s mannerisms aren’t appreciably different here than they’d be eight years later in the Lord of the Rings. And of course Culkin’s acting is indistinguishable from his time playing Kevin. Lindsay: The consequences of his behavior are different, of course, but the character is virtually unchanged. Even his abilities are reminiscent of Kevin’s. He builds elaborate devices and traps, he manipulates his enemies into dangerous situations, and he is relentless in protecting his property. Erin: When his cousin begins forging relationships with his family, he views it as a sort of invasion and acts accordingly. He reacts aggressively when his mother locates a trophy he took after the death of his brother. And of course he’ll do absolutely anything to protect himself from being discovered. Lindsay: Usually with the same glee and playful smile he had as Kevin. Essentially, this plays out a bit like an alternate universe fanfiction where Kevin and Frodo are human cousins in the real world. Arguably, each boy's behavior is still in character. Erin: Yeah, assuming you interpret Kevin as being sociopathic in the Home Alone movies. Lindsay: It should be noted, none of this was intended by the makers of The Good Son. While it came out on the heels of Home Alone 2, it was in development as far back as 1988 with different leads. Erin: Culkin was only brought on to placate his father, who viewed the movie as an opportunity to help him break out of potential typecasting and expand his acting range. Lindsay: He viewed Kevin as a silly, comedic role and The Good Son as a script with serious dramatic potential. Erin: He failed to realize there were more similarities between the roles than differences. If anything, The Good Son reinforced the idea that Culkin’s defining role was as a sadist. Lindsay: We mentioned :DRYVRS at the start of this, but that’s far from the only time that Home Alone has been reimagined as a horror movie. Even a quick Youtube search will pull up scenes from the series recut into horror trailers. Erin: Yeah, and the web series “Honest Action” consulted with a medical doctor to estimate the severity of the injuries that were sustained by Harry and Marv. Lindsay: They concluded Harry could have died as many as eight times and Marv may have lost his life thirteen times over the course of the two movies. This is in addition to numerous serious non-lethal injuries. Erin: There’s also an online theory that Kevin grows up to become Jigsaw from the Saw franchise. Now, I haven’t actually seen any of those movies, but it’s not hard to imagine a connection. Lindsay: The idea that Kevin is violent and the Home Alone movies are disturbing isn’t a new observation. From the beginning, critics noted this was a deceptively dark series. Lindsay: Regardless of whether you enjoy these movies or not, it’s difficult to deny that the violence is shocking at times. And that’s been an ongoing theme from both critics and fans since the movie was released. Erin: But a 2016 film offers the best dissection of Kevin’s archetype I’ve seen. And... spoiler warning? Lindsay: You haven’t said the movie’s name. Erin: I know, but even connecting the movie to this topic is a spoiler. So, I guess I’m starting with a spoiler warning for the upcoming spoiler warning. Lindsay: Is there an award for the least useful spoiler warning in history? Erin: The movie is called, “Better Watch Out.” And if you’re a horror fan who dislikes spoilers, I’m already sorry. It’s easily the best movie we’re discussing on the podcast today and one of the better Christmas horror movies I’ve seen. Lindsay: We won’t be offended if you decide to hit pause, track the movie down, then listen to the rest of this podcast later. Erin: But if you do keep listening, be warned I’m going to be discussing the plot and premise. Lindsay: Which obviously has something to do with Home Alone. Erin: Definitely. It’s more or less the inspiration driving one of the movie’s two main characters, who sees himself as sort of an updated Kevin McCallister. Lindsay: This kid’s name is Luke. And this time, he is definitely a sociopath. Erin: The first act revolves around Luke faking a home invasion in order to seem heroic in the eyes of his babysitter. He’s essentially trying to make her think they’re in a “Home Alone”-style scenario. Lindsay: This is perversely presented as an attempt to seduce her. Erin: Yes, though his ultimate motive might have been a little different. Regardless, he winds up imprisoning her, then he begins a series of sadistic games resulting in the deaths of several characters. One of these recreates the infamous “swinging paint cans” from Home Alone, but with decidedly more lethal results. Lindsay: It’s a disturbing movie, but it’s also funny. Erin: I find it significantly more funny than Home Alone. It’s definitely not for everyone, but horror fans should find a lot to like. Erin: With all that being said, I’d like to get back to Kevin McCallister and the context he’s presented in. Lindsay: In other words, you want to get to the reason we made this episode. Erin: Precisely. And that starts with a question: what else do we know about Kevin? We’ve already talked about his personality, and we've speculated about his psychology, but beyond these things, what does the movie tell us about him? Lindsay: He likes gangster movies even though they scare him. Erin: But what about his family? Lindsay: They live in a nice neighborhood. Erin: A very nice neighborhood! Kevin’s brother calls it the most boring street in America. But what does that imply? Lindsay: That they’re rich. It’s obvious from looking at the place. Which is why Harry and Marv are so interested in it, anyway. Erin: It’s an expensive house in an expensive neighborhood. We only see a few of Kevin’s neighbors, but they all have something else in common with Kevin. Erin: Yup, we’re going there. Lindsay: We should probably mention every significant character in Home Alone 1 and 2 is white. There are several minor characters played by minority actors, but no one in a major role. Erin: It’s probably best that Harry and Marv were white, given their roles. And, contrary to how it may seem, we’re not actually saying there's anything wrong with Culkin’s casting. But I think it’s worth noting. Lindsay: The director said he met with hundreds of kids before going with Culkin, so it was definitely a choice. Kevin and his family looked the way the director wanted them to look. Erin: Keep in mind that Kevin is supposed to be sort of an ‘every-kid.’ He’s intended as a POV character that millions of children can look at and imagine themselves. That’s the selling point of the movie. Kids see Kevin being creative, clever, and mischievous - traits that they presumably share - and he's managing to fight off the bad guys. Lindsay: So the kid who serves as a symbol for the audience is rich, white, male, and Christian. Erin: We know Home Alone shouldn’t be singled out here. Entertainment in the 80’s and 90’s was overwhelmingly skewed towards those demographics. Lindsay: Also, literally every other decade, including this one. Erin: True. The economic aspects were admittedly conducive to the premise. If Kevin’s family hadn’t lived in an expensive house, it would be hard to justify the thieves’ interest in the property. It also would have complicated Kevin’s maze of death. Lindsay: But it’s still a reminder that Hollywood has a serious diversity issue. The people whose stories get told tend to look like the people writing and directing those stories. Or, in this case, like their children. Erin: It gets more troubling when we consider Kevin’s enemies. Everyone he torments in Home Alone appears to come from a lower economic class than him. Lindsay: The thieves almost certainly come from impoverished backgrounds. At least that’s what I’d infer from their clothing, mannerisms, and motivation. And from Harry’s offhand statement in Home Alone 2 about never reaching sixth grade. Erin: The pizza delivery boy works a service job, and the one infraction we see him make is to disrespect the McCallisters’ property. This is something we need to highlight - these movies are extremely fixated on private property. Lindsay: There’s a definite parallel there with the thieves. The McCallisters have a lovely home, and the antagonists in the first movie are all invading or messing with it. Erin: There’s a undertone of class in this movie. Kevin is portrayed as protecting his house - that’s where his moral standing comes from. Lindsay: He’s protecting it from poor people trying to take or damage what he sees as his. The second movie subverts this to a degree by having Kevin protect money intended for charity, but it is still property. Erin: And the movie goes out of its way to establish Kevin’s moral center by showing that he wants to pay back the store owner for a broken window. The difference between Kevin and the thieves is that he respects private property. Lindsay: And he doesn’t invade other people’s homes or businesses. Or communities. Erin: In other words, the movie is playing on the same fears that permeate upper class white communities. The fear that people who are different than us are going to cross some imaginary border and take something that’s ours. Lindsay: So. Is Kevin a sociopath? Is he a monster? Erin: In the movies, no, not really. He doesn’t show much empathy, but there are enough counterexamples to demonstrate that he is capable of seeing people as people. But that was always the wrong question. The right question is whether there’s something monstrous about what he represents. Lindsay: Okay, picture it in the real world. In order to protect his property, a boy severely injures or kills a criminal who (initially at least) isn’t being violent. Is that boy really a hero? What about the man or woman who terrorizes someone in the service industry, just because they feel that they can? Erin: Expand the thought experiment. A young man, wealthy and white, injures or kills a person because he thinks that something he owns, or something he is entitled to, might be taken away. Is that person really doing the right thing? Lindsay: In the decades since Home Alone came out, we’ve seen an increase in nationalism and reactionary politics. Erin: We’ve seen privileged classes - mostly but not exclusively straight white men - who grew up with these movies embrace these fears. We’ve seen them respond with violence and with hate while perceiving themselves as the victims of some imagined invasion narrative. Lindsay: Before everyone assumes otherwise, we’re not actually saying that the Home Alone movies are responsible for any of this. Erin: No, I don’t seriously think they had a major impact on society. But I do think they offer a window into the mindset that our current society came from. Lindsay: In other words, they’re a reflection of an idea that permeates our culture, splitting people into extreme categories: a few worthy of protection and the rest unworthy of even respect. Erin: And that idea has into something truly terrifying. Something so incapable of empathy it’s willing to cast refugees and children as criminals. Lindsay: And Kevin McCallister can be seen as a symbol for just that idea. Movies reflect the time they were made, but they also reflect the viewer. What does it mean to identify with Kevin today? Erin: We realize some people out there may be angry at some of these conclusions. Erin: Then you can save us all some time and toss your complaints in the trash bin in the lobby. You’ll find it down the hall and to the left. Erin: And me, Erin Snyder. For more of our thoughts on the darker aspects of the holidays, you can follow us on Facebook and Twitter. You’ll find links at our main site, MainliningChristmas.com. Lindsay: There you’ll also find a transcript of this episode and links to more information about these movies. Erin: We’ll see you next month for another installment. In the meantime, DON'T FORGET TO VOTE.